Karim Llaro is a nurse who has worked with Socios En Salud, as Partners In Health is known in Peru, for more than 20 years. She began in the late 1990s as a field nurse, administering tuberculosis treatments to patients in their homes. She then became the TB program coordinator for northern Lima, the capital of Peru, before transitioning two years later to TB program coordinator for central Lima. Since 2008, she has been the TB program coordinator for Global Fund-supported work. 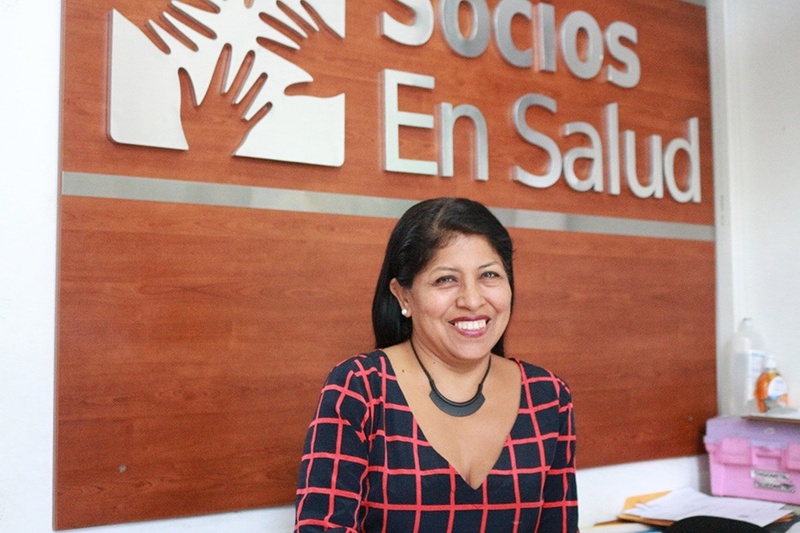 Below, she reflects on how she came to work with Socios En Salud, and what she’s learned over two decades of providing care to some of Peru’s most vulnerable TB patients. I finished my nursing degree in early 1997. Then I began my internship, which helped me decide if I would like to work in clinics and hospitals or within the community. Meanwhile, a colleague told me that there was a job posting looking for people to make home visits to patients living with drug-resistant tuberculosis around Carabayllo District. It was an excellent opportunity, was close to my home, and I felt I would be able to learn a lot. When I began at Socios En Salud, I wasn’t afraid of getting sick because I knew the risks involved with working with TB patients; however, my older daughter just had turned one, and my family was very afraid of that possibility. Even so, I kept going because I had fallen in love with the work. My work at Socios En Salud included visiting patients, bringing them medicine, tending to the harmful side effects that the drugs could bring, filling out reports for doctors, and—above all else—accompanying patients along the difficult journey they had to travel. Every day was a challenge. Our objective was to not allow a single patient to die of TB. For that to happen, there had to be not only a nurse, but also a psychologist and social worker. The patients’ problems were not just clinical, but also emotional and, especially, financial. However, just my presence was enough for them to feel calmer and have more hope. Many times, I was the shield against the patient’s family members, who didn’t understand that the patient was going through difficult times and secondary effects from the medications they took daily, such as drowsiness, fatigue, lack of sexual appetite, and hallucinations. There were very talkative and thankful patients, as well as reserved and quiet ones; however, I could tell that they each waited for me each day with anticipation and happiness. Some patients used to call me a guardian angel, because I had more faith than they did that they would find a cure. The majority of patients lived in remote and dangerous slums. Yet, when I finished giving them their medication, they would accompany me to the door and warn their neighbors that they better not do anything to me, because I was their angel. There was not a single day that was the same. At Socios En Salud, every day was different despite the fact that we knew what was awaiting us. This was a very enriching experience for me. I learned to value life and that every person deserves high-quality, comprehensive care. We believe that no one should die from a cureable diease like tuberculosis. Make a gift today to help staff like Karim Llaro continue to expand their work to ensure all patients suffering from TB are able to receive the treatment they need. Read more about how PIH is fighting TB in Peru through mobile rapid testing clinics or see how gaining access to treatment and support for MDR-TB changed the life of one patient in Liberia.